Book is available on Amazon and Kindle (e-format). Trilingual version of Chekhov’s romance story. I wrote the book from 1995 to 2004. There was about 4-year break within this period. After the break I continued writing because one of my correspondents from Russia asked me: “How come you are not sending us your stories anymore? We loved your stories!” This remark inspired me to continue writing. In summer of 2004 I went to Moscow, Russia and made an agreement with the publishing house “Golos” handled by the writer Alyoshkin to publish 1000 copies. 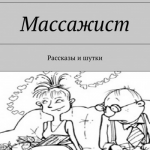 The picture of that first Moscow edition you see on the front cover of this Amazon 2010 edition. The popular fairy-tale by brothers Grimm found in this five language book its wonderfully original expression. Adults, children, parents, students and teachers can use the beautiful book while reviewing their knowledge of the five world languages: German, English, French, Spanish, and Russian. 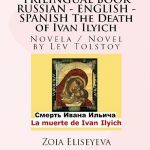 The book has Grammar notes and tables of English and German verbs with translation into Spanish and Russian. 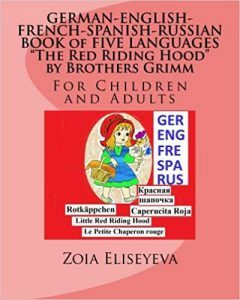 The fairy-tale “Little Red Riding Hood” is presented at first in 5-language format, five languages in paragraphs on a separate, well-defined page that will open nicely on any e-device. In the end of the book the tale is presented in each language that uses Latin alphabet in its entirety. The book is a wonderful learning and entertaining tool for any age. 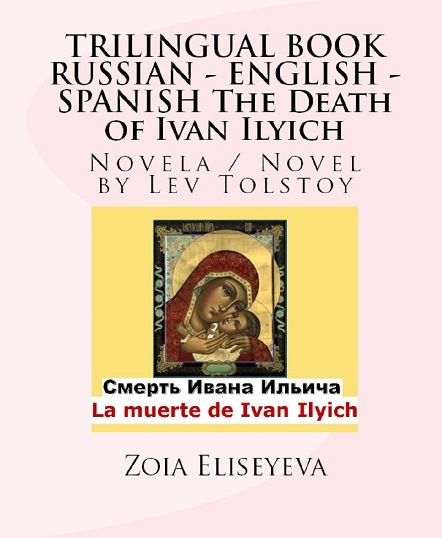 It is the first five-language book based on classical literature by a creative linguist Zoia Eliseyeva. 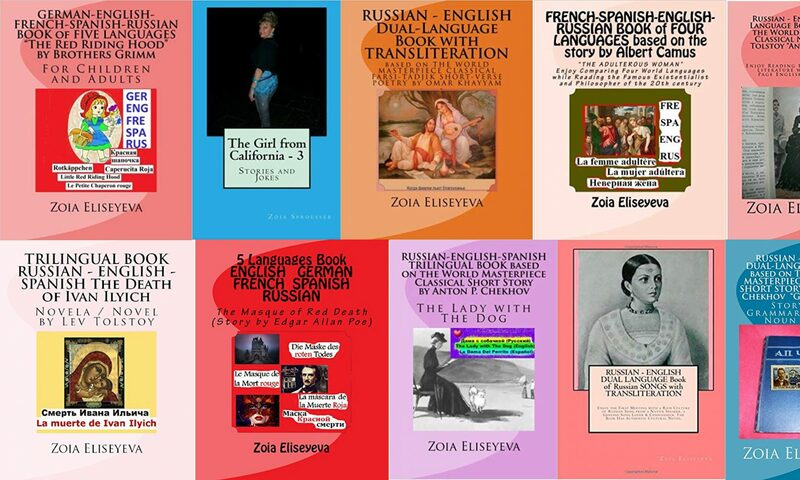 Zoia Eliseyeva teaches three languages. She has Master’s Degree in Education. 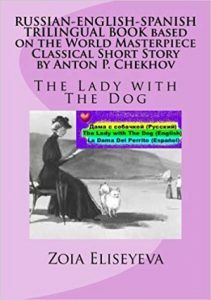 Her first stories were published twenty years ago in Russia and in USA. 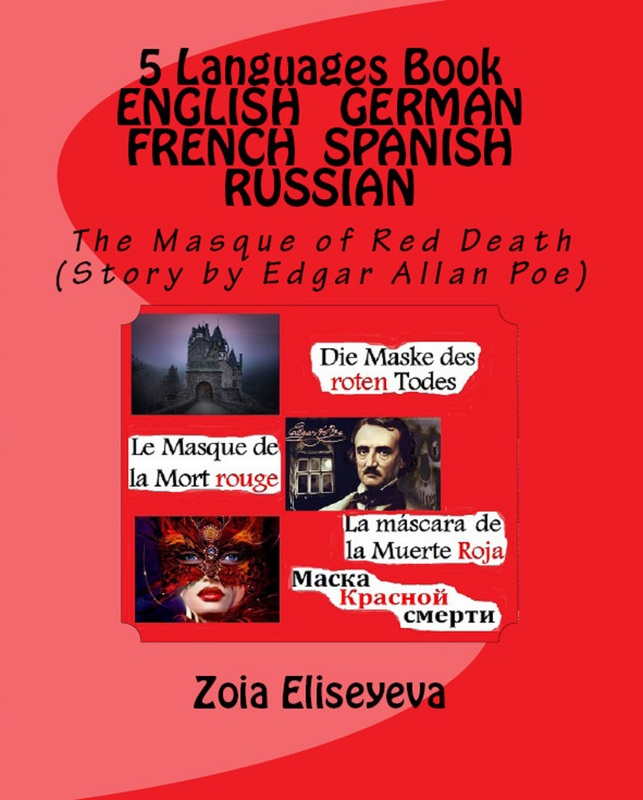 English-German-French-Spanish-Russian – The BOOK OF FIVE LANGUAGES based on a complete story by Edgar Allan Poe. The 3 extracts follow, being read by 3 native speakers of French, English, and Russian respectively. Why am I always shy about my accent in French? Whatever is the reason, I asked Pierre, my French pen pal of 23 years to audio this extract for me. The pronunciation of a native speaker is always valuable. Sorry for the formatting! The site is constantly under construction and some editing features do not work quite as expected on one push of a button. 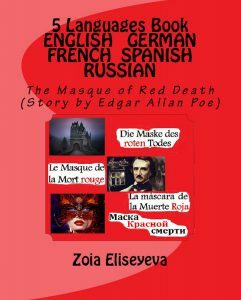 ZE on Dec 26 2018 from AZ, USA The five languages book “The Masque of the Red Death” is devoted to Edgar Poe’s story – a rich multilingual reading and studying experience! It is recommended for students, professors, and all people (adults or teenagers), who are interested in the presented languages: English, German, French, Spanish, and Russian. The languages belong to three different language groups: Germanic, Romance, Slavic. The comparison of the translations will bring to a reader an incomparable experience of language study while enjoying reading the complete text story by the brilliant unique American author. Take it with you on an uninhabited island! Your life will be more entertaining than that of the Robinson Crusoe, because it will take you a long time to figure out the five languages, unless you have already devoted significant time and effort to each of the five. For the convenience of the reader who wants to concentrate on just one language, each of the 5 translations is also reproduced, at the back of the book, in an uninterrupted text format. The book also has some entertaining multilingual comparative vocabulary exercises with the answers – across the five languages. 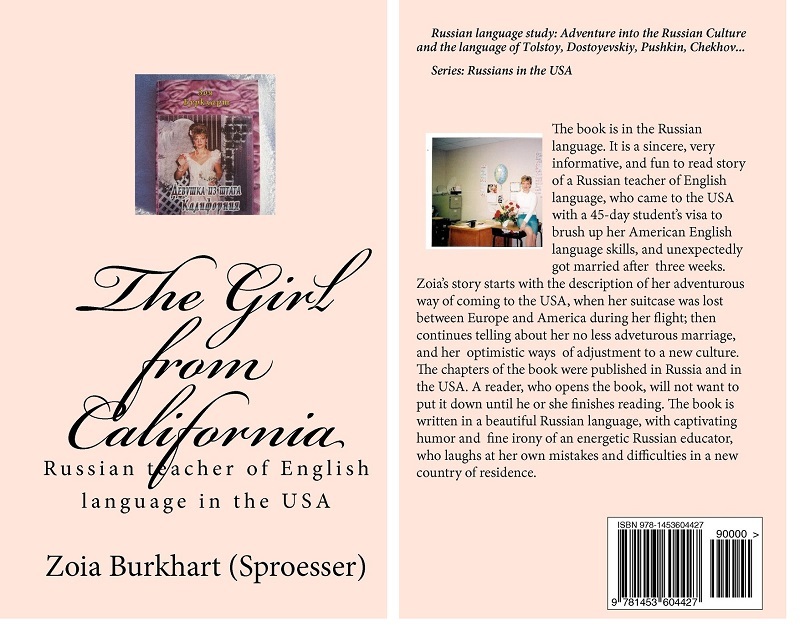 Zoia Eliseyeva (Sproesser, Burkhart by marriages) has been writing since 1996, and her multilingual books (over 20) have been contributing to the language study in USA, Russia, and around the world for quite a few years. 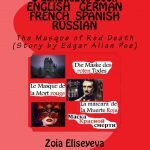 Zoia has Master’s Degree in Education and has been appreciated by her students of English, Russian, and Spanish languages in Europe, USA, and Mexico. A native speaker of English Michael, born in LA, California, reads the extract. 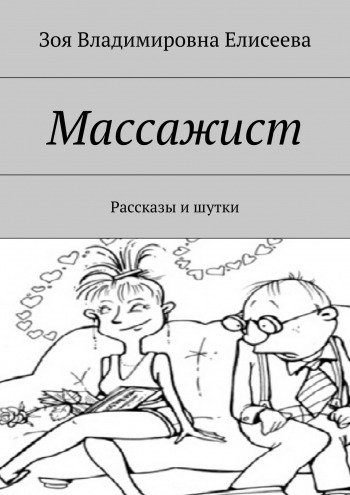 He is also one of the characters in my first book in Russian language “The Girl from California”. 1st edition – by Zoia Burkhart. 2nd edition – by Zoia Sproesser (Burkhart), later editions by Zoia Eliseyeva. The above mentioned are my last names by two marriages in USA from 1995-2014. Eliseyeva is my maiden last name. стр Можно читать пока не выучишь все пять языков. хотя можно было и вот эдак.